PTTD / AAFF | Marathon Orthotics, Inc.
Posterior Tibialis Tendon Dysfunction / Adult Aquired Flat Foot. This functional device has been an extremely popular and successful solution for Posterior Tibialis Tendon Dysfunction (PTTD), sometimes called Adult Aquired Flat Foot (AAFF). Select a functional shell, mid-layer and top cover of your choice. For maximum support, we recommend the addition of a P-Wing to this orthotic. The unique shape, posting and medial padding of the P-Wing has worked extremely well for patients with PTTD/AAFF. This option is located under the Accommodations section on our prescription order form, simply check P-Wing. 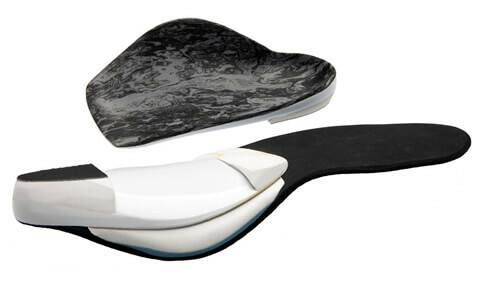 Note: For an alternative, general use orthotic treatment for this pathology please see the MVP Sport Orthotic.